Hi there you luck lot! Lookie what I have for you! It's another author interview!! This time with Gwenda Bond, author of the up-coming Strange Chemistry release Blackwood. How did you find writing a YA novel, compared to writing articles and such? Where did you get the inspiration for Blackwood? History and the interstate. I’d always been fascinated by the story of the Lost Colony, an intriguing bit of history that gets mentioned enticingly in elementary school history classes in the U.S. and then pretty much dropped. But how can anyone resist a mystery like that, slipped casually among dry facts and dates? So it was always there in the back of my mind. The story came rushing back to the surface when my husband and I were on a road trip and passed an interstate sign for Roanoke (Virginia, not Roanoke Island, but no matter). After that, I knew I wanted to do a modern Lost Colony story set on the island, and so I picked up some research material. The more I found out about the history, the more intriguing the mystery became, and that all evolved into Blackwood. Do you have any new projects that you're working on at the moment? I do! I’m actually just about to turn in a draft (in fact, with any luck, I might have already done so by the time this is running) of a new book that will be out from Strange Chemistry next year. We’ll be releasing some more information it very soon, but for now I can tell you it’s not related to Blackwood and is a near future urban fantasy set in Washington, D.C.
What has been your toughest criticism as a writer? This is hard for me to answer because I’m my own worst critic. I’m always trying my best to improve at any number of things in my writing. And I feel so early on… I do think you have to get to the point where you don’t hold onto individual criticisms too tightly, but just figure out where they can make your work better, apply what you can, and then let them go. So my toughest criticisms are the ones that are most welcome—the ones I get from my writing friends and early readers, from my agent and editor—because they’re the ones that help me get better. What has been your biggest compliment? The biggest compliment has definitely been when I’ve seen early reader reactions to Blackwood from people who read the book I wanted to write. Who really connected with the characters and the oddities and strangeness. I really do believe a book is a collaboration that exists between the author and every individual reader. So when that collaboration is worth it for the reader, that’s a huge compliment. It’s a kind of magic. Which one author would you say has inspired you the most? Oh, so hard! I honestly don’t think I can pick just one. I’ve always been such a reader that I never had just one favorite author, but a whole list of favorites. I’d kick myself for leaving off somebody if I started naming people. My earliest favorite was probably The Tale of Peter Rabbit by Beatrix Potter. I wore it out. And my grandmother was always threatening me and my cousins with castor oil if we didn’t behave, which seemed both terrible and exotic because we’d never encountered it anywhere but in the story. I just finished Courtney Summers’ This Is Not a Test, which is a fabulously scary zombie book. If you could invite five fictional characters to your dinner party, who would they be and why? - Claire DeWitt (from Sara Gran’s Claire DeWitt and the City of the Dead), because it seems certain this would up the chance for a surreal occurrence and possibly a mystery we could all solve together. I hope to spend it writing more books. Beyond that, I really can’t say, but I hope there are lots of (good) surprises in store too. Tim Wynne-Jones, an amazing Canadian writer, told me: The most important thing every writer learns is her process. This has proven to be very true. You just have to trust your process, and keep working. The idea of having fans and readers completely humbles me. I would say: thank you. I realise there are a lot of ways you can spend your time, and that you chose to spend it with my work makes me happier than I can say. Thank you Gwenda for a fab interview! 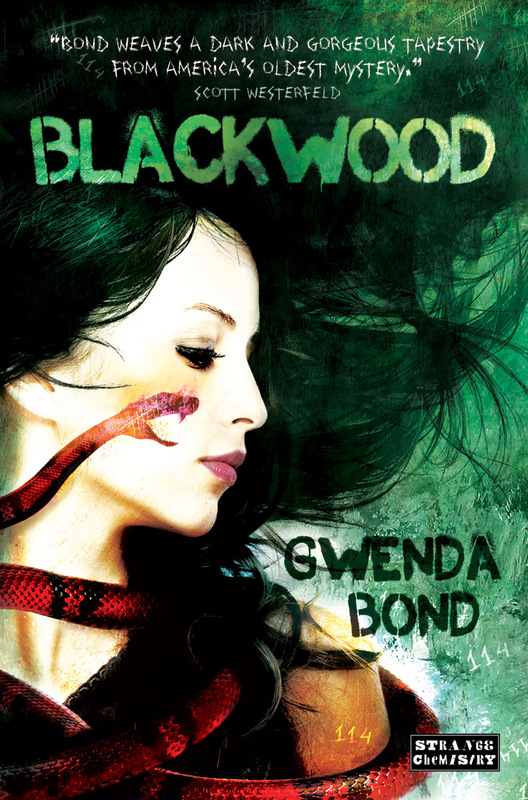 You can get your hands on Gwenda's book Blackwood as of the 6th September via Strange Chemistry Books. Feel free to leave a comment to let us know what you think. What a great interview! interesting questions and answers that make me want all of Gwenda's books.